Who’s That Elephant in the Room? Some say the stigma of mental health is fading in the U.S. but I’m not seeing it. Not in veterinary medicine. I travel around the country training veterinarians, staff and other animal workers about compassion fatigue. However this first requires we acknowledge the elephant in the room. 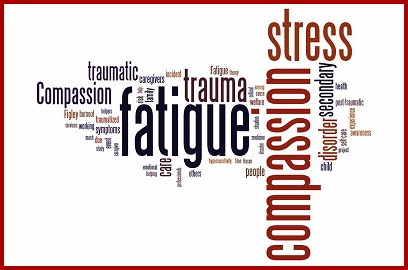 That elephant, also known as compassion fatigue (or compassion stress), is the mental, physical and emotional exhaustion that results over time when one is repeatedly exposed to the pain and suffering of another. It is literally the erosion of our compassion(Figley). “But it’s the nature of the work” you say. “We help sick and suffering animals, that’s what veterinary medicine is all about.” Correct. 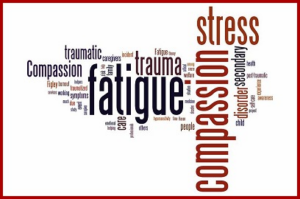 Compassion fatigue is the normal consequence of doing a good job, of caring. If you are currently suffering from the effects of your work, know that not only are you not alone, you are not weak or incapable and have done nothing wrong. You should also know that you can recover. How much training did you receive in vet school on burnout, compassion fatigue, secondary trauma or psychological trauma? Would it surprise you to find out that most mental health workers received the same amount as you? None. And meanwhile the CDC reported in its recent findings that 1 out of 6 veterinarians have considered suicide. Additionally the stats for those experiencing psychological distress, depressive episodes and suicide attempts are all higher in women veterinarians than in men. And yet we don’t want to talk about it. But this is nothing new. When veterinarians were predominately male, white and 35-55 yrs old the suicide rates were just as high. We just didn’t hear about them. Their stories didn’t spread through social media like they do now but they were senseless tragedies nonetheless. How many of todays veterinarians were trained under those emotionally protected, stoic men and adopted the secret “don’t ever let them see you sweat (or God forbid cry)” code? We know that among veterinarians there was and still is, a reluctance to seek help that exceeds that of the average person. Do we believe that we are not supposed to be emotionally affected by this work? That when we leave the practice for the day we leave the heartache behind? Are we holding ourselves to an impossible standard? The stigma exists because we have let it. We continue a facade that has been handed down from generations of veterinarians yet veterinary medicine looks nothing like it did generations ago. The quality of medicine and care is light years from once it came as is the human-animal bond. We are now practically bringing you our children rather than our pets and with that paradox of role comes a great responsibility. I question if that responsibility is fair to you but it exists nonetheless. You must ask yourself, do I have protective measures in place to shield me from the emotional residue? Have I been taught how to cultivate resilience? Do I have practices in place to not only reduce my stress but to manage it? It is time to change the stigma surrounding mental health and veterinary medicine. This is our dawn. We owe it to those that found suicide to be their only way out, that they did not die in vain.